A late win from San Jose capped off our second weekend of MLS, which also included wins for Vancouver and Chivas. Otherwise, though, the West stumbled a bit this go around with losses for RSL, Portland, Colorado, and Dallas. RSL extended their winless-at-RFK streak this weekend, falling 1-0 to DC United. Neither side displayed especially pretty soccer in this one, and RSL struggled to find chances in the attacking third. While goalkeeper Nick Rimando was solid as ever, doing particularly well to stop a one-on-one shot from Carlos Ruiz in stoppage time, he could do little to keep out Lionard Pajoy’s goal. After Rimando leaped to save a chip from John Thorrington, the rebound fell to Pajoy, who had no difficulties heading it home. The RSL of this match looked a different team from the one that beat San Jose last weekend, and they’ll want to recapture some of their first week form going forward. The Caps made it two wins out of two and climbed to the top of the conference with their 2-1 home win over the Columbus Crew. Despite losing captain Jay DeMerit to injury, Vancouver rose to the challenge and looked the better side over 90 minutes. Daigo Kobayashi scored a fantastic goal just 6 minutes into the game, catching Columbus goalkeeper Andy Gruenebaum off his line and sending a shot sailing into the upper left corner. The Whitecaps’ second goal came courtesy of Kenny Miller in the 57th minute, who dispossessed Gláuber and went rushing in on goal to score the game-winner. 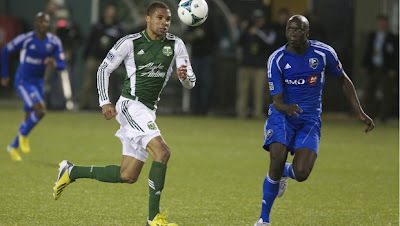 This week Portland became the second Cascadia team in two weeks to fall against the Montreal Impact. 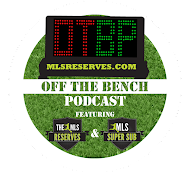 After going down 2-0 in the first half, the Timbers came out attacking in the second, reminiscent of their revival against New York last weekend. They partly succeeded in the 80th minute with a Ryan Johnson header, but an equalizer wasn’t to come. Jose Valencia came close in stoppage time after Darlington Nagbe beat the Impact defense and found him in the box, but the shot was straight at keeper Troy Perkins. For Portland, while their comeback energy shows heart, they need more than that to win games. In their first home opener loss in ten years, the Colorado Rapids dominated possession but failed to turn that dominance into goals, recalling their loss to FC Dallas from last weekend. The Rapids equalized after 67 minutes thanks to Jamie Smith, cancelling out Sébastien Le Toux’s first half goal, but Philly’s Jack McInerney put the Union back ahead with 10 minutes left in the game, taking advantage of Colorado’s push for a winner. The home side also saw captain Pablo Mastroeni forced to leave the game early with what looked like a hamstring injury, further compounding the evening’s disappointment. Putting their opening loss behind them, Chivas came from behind to beat Dallas 3-1 at the Home Depot Center. David Ferreira opened the scoring on 57 minutes with an excellent right-footed strike, but 11 minutes later Juan Agudelo tied it up for Chivas. In the 76th minute, Oswaldo Minda was in the right place at the right time, cleaning up a mistake from Dallas’ George John. Chivas then ended the game with a flourish as Giovani Casillas beat Fernández on a breakaway in stoppage time. For Chivas, the win is a big step in the right direction. For Dallas, the loss is disappointing after the gutted-out win last weekend against Colorado. The Quakes, though not quite looking like the team that won the Supporters’ Shield last season, proved they can still win games late even if they’re missing major players. It looked for most of the game like San Jose would lose again this week after New York went ahead in the first half, but an 83rd minute goal from Adam Jahn, largely thanks to an assist from Sam Cronin, spurred the Quakes onward in the final minutes. In stoppage time, the Red Bulls’ Roy Miller committed a handball in the box and gave up a penalty. GK Luis Robles saved Chris Wondolowski’s first attempt, but Miller was then called for encroachment and Wondo buried his second try. The last minute comebacks for San Jose have become the norm at this point. How many more will we see this year? Not strictly MLS related, but the Seattle Sounders and LA Galaxy play in CONCACAF Champions League matches this coming week. Both teams will be at home, facing Tigres and Herediano respectively, and both teams are in good positions. Catch those games Tuesday and Wednesday night on Fox Soccer. Chivas won a game, guys. That’s its own storyline, honestly. But elsewhere, RSL went from a strong road performance to a weak one, while Vancouver have started off very well with their six points, and San Jose treated us to more Goonie tactics. Next week is rivalry week, so we’ve got a slate of great games. First we’ll start with San Jose heading out to Columbus, which actually, of course, isn’t a rivalry at all. But the rest of our match ups definitely are rivalries, so don’t worry. RSL take on Colorado, Seattle host Portland, Dallas welcome Houston, and finally LA face Chivas. Get pumped to settle in for some good stuff. Roy Miller? Just kidding. 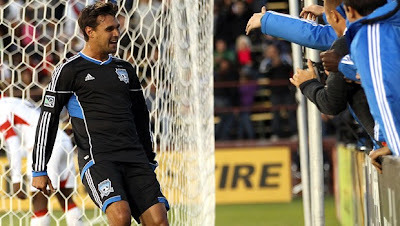 I’m giving it to Adam Jahn, who scored the equalizing goal for the Quakes and then helped draw the penalty that gave them the win.